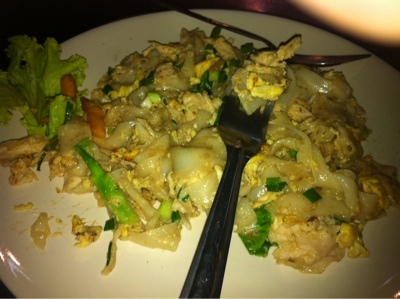 For our first dinner in Sukhumvit we had to go to the famous Soi 38. 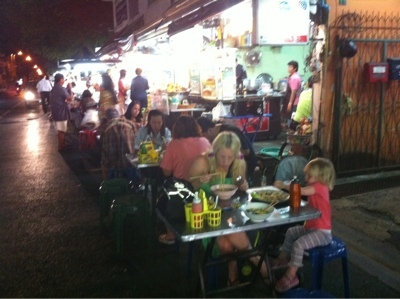 This is a street food legend and contains lots of different vendors hawking all kinds of Thai street food. The tables are by the side if the road and you basically sit where you want and the find the food you want and they bring it to you. 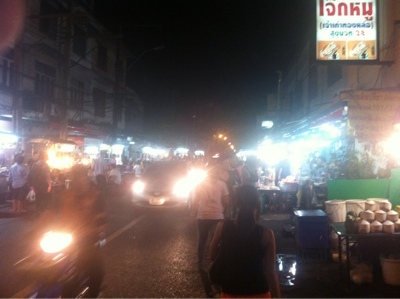 The street is open to cars and scooters who treat it like a drive through! We were there early so not all the vendors were open but we still had no problem finding meals we wanted. 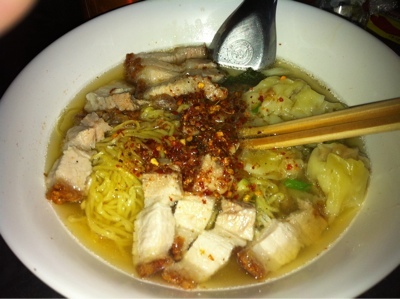 We both had a hankering for soup noodles as it had been a few days or maybe a week since our last bowls. 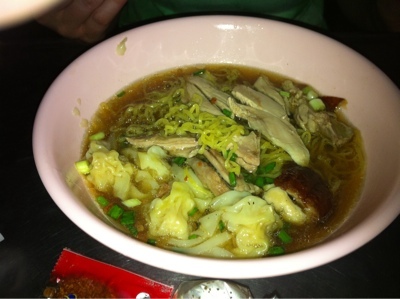 I had yellow noodles with wontons and crispy pork and Tina the same but with wontons and duck. I really gave mine a seasoning with the dried chilli and once again sweated my way though the bowl in no time with the usual wide grin on my face. Just wonderful! Tina was pretty much the same without the sweat. Charlie specifically asked for noodles and chicken (according to Tina) so Tina got her the wide rice noodles stir fried with chicken. 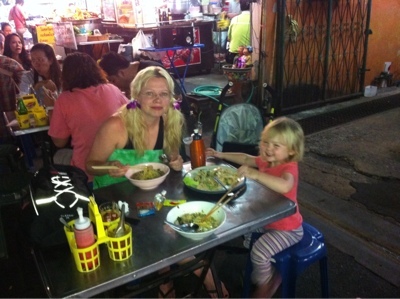 Charlie wasn't keen on them, I reckon she prefers yellow noodles like her Dad! As usual we were stuffed (in more ways than one) so we returned to our room and Tina cooked Charlie up a toasted sandwich that was thoroughly enjoyed while I researched tomorrow's food (and shopping) expedition. Very impressed/amazed at the quantity of food consumed - but I guess you do have pretty good genes in that regard!